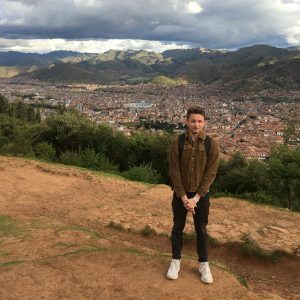 Why did you choose to go volunteering in Peru? First of all, I just wanted to go to South America, to learn the language and everything. Then I looked for some options. The volunteering has some good side effects and that’s why I choose the way of volunteering instead of just travelling. I just looked for different offers in different countries in South America and this seemed to me a good offer. Besides that I have a Peruvian back home in Germany, so it was an easy choice. He told me it was a great country, Cusco and the area around is great. How long are you staying in Cuzco? In total I am staying in Cusco for six months, quite a time. What is your schedule for Spanish/Volunteering? In the first month I just had the language school, learning Spanish. And now I do the volunteering and the Kindergarten from 9 till 12:30. After that I’ve got free time. In my free time I do some trips, there are a lot of things to do around here. What is your opinion about the Spanish lessons? The Spanish lessons were pretty good. The teachers explain very well to you. Most of the stuff I did already at my school in Germany before I got here, so it was more like refreshing old skills. Now I am pretty sure I got all the grammar basics and just need to work on my vocabulairy. What is your opinion so far about the volunteering? I’ve only did it for a week by now, but I liked it, you work a lot on your own. In the kindergarten, the kids are quite nice, the location of the kindergarten is good, the kindergarten itself is a good house, a good building, a good area. What do you think about the cultural activities and Cuzco? It’s cool, there are a lot of things to do, there are a lot of offers you can choose. In total there are some good offers and a lot of things to do. I definitely like the city, it’s beautiful. Why would you recommend people Peru Volunteer? After nearly two months I would totally recommend it to others. Marcelo and Thomas are good, they care for you, they always try to help you. The appartment is great, the area is great of course, you get to the city in around 10 to 15 minutes. There are no reasons not to choose Peru Volunteer. I think it is for everyone quite a good experience to see some other things out of Europe or other countries and you learn something about different cultures and a different way of living. Well, I wrote to a couple of volunteering companies, but Thomas (the owner of Peru Volunteer) was the only one who wrote me back personally and really quick. I also had Bali in mind and some other countries. I wanted to do volunteering, because I really like animals and I want to study to become a Veterinarian. So to gain some experience. How long are you staying in Cusco? Totally six weeks. What is your schedule for Spanish/Volunteering? I had two weeks of Spanish and four weeks of volunteering at two dog shelters. What is your opinion so far about the Spanish lessons? That was great! It was so much fun and I really think I’ve learned a lot. That’s great too. A little exhausting, but it is what I wanted to do so. What do you think about the cultural activities and Cusco? Cusco… Me encanta! The people are very nice, I didn’t had the feeling I should be scared or that it’s dangerous. I have no problem to go to the city by my own. Also the teachers of the Spanish school organize a lot of cool stuff for us, they come with us and explain a lot, so it’s almost like private guides. I like Cusco very much. 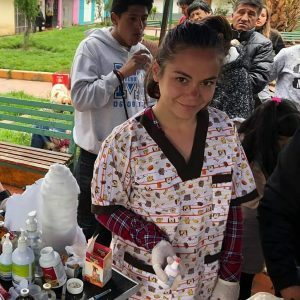 (Why) would you recommend people Peru Volunteer? Of course I would. Because you never feel really alone. You have Marcelo (Peru Volunteer coordinator) who watches over you. And also Thomas is very nice. They really listened to what I wanted. There is so much stuff we can do. It’s not just like the dog shelter, it’s also the school and the art projects, it is very diverse. « Rainbow Mountain: an absolute must-see!